In the summer of 2009 I went for a walk across a 10 kilometres long prehistoric landscape feature called the Dorset Cursus, probably a ritual processional walk-way constructed earlier than Stonehenge, containing a solar alignment, or a noted position on the horizon where the sun sets or rises at a point in the seasonal cycle of the year. During this walk I discovered some mysterious markings inside a small parish church near to the erstwhile processional way. Earlier, I had visited the Dorset hamlet of Pentridge, meaning ‘Hill of the Boar’, from ‘pen’ (hill) and ‘twrch’ (boar). In modern Welsh ‘twrch’ means a male boar, but the word’s root is Proto Indo-European [PIE, a language of about 3000 BCE] and related to Irish ‘orc’ and ‘torc’ meaning the same thing, but also English ‘farrow’ meaning a litter of pigs. The earliest known form is ‘porko-‘ [pork], closely resembling ‘orc’ and again meaning farrow, so there seem to be echoes of maternal fertility within the word’s etymology. When the fearsome boar Twrch Trwyth is first encountered in a medieval Welsh story called ‘Culhwch and Owen’ it is accompanied by a farrow of seven piglets. Additionally, a pagan Irish goddess called Brigit – of whom we shall hear more later - was associated with fire, possibly solar in nature, and possessed a boar called Torc Triath, the ‘king of boars’. The hill above Pentridge is a local high point and surveys all principle features along the route of the ancient cursus, as it would have done over 5000 years ago. I believe Pentridge Hill was initially a sacred, totemic location and we know today that boar or pigs constituted an important facet of ceremonial feasting in the New Stone Age. Pigs’ remains have been found associated with the Cursus. The boar may have been associated with the sun because of the sunray-like bristles which ran down the length of its back. Echoes of the sacred boar may linger on in Welsh ‘Hwch Ddu Gota’, the bob-tailed black sow seen rising from the dying embers of Hallowe’en fires. Also there is the Christmas custom of the presentation of the boar’s head, which occurs within several days of the winter solstice, a skyline phenomenon the builders of the Dorset Cursus would have been keenly aware of. We can tell this because of some communal, seasonal ritual theatre. Up until the 1930’s there was a local tradition that Thickthorn Down long barrow concealed a ‘golden coffin’. In fact the archaeologist Stuart Piggott discovered that the original mound contained nothing at all, although it was used subsequently. Incredibly this living folklore seems to preserve a 5000 year old memory of the primary Cursus ritual: the south section of the Cursus has been demonstrated to align Thickthorn Down with the midwinter sunset, when observed from Gussage Hill long barrow or burial chamber, constituting an annual drama of setting solar gold on the Dorset horizon. This approximate view is replicated from Pentridge Hill but from an elevated position. The parish church at Pentridge practically backs onto the line of the Cursus and is closer to it than many of the contemporary prehistoric henge forms and monuments. I found it slightly curious therefore that there was no reference to the ritual landscape at the church. Perhaps the church was erected over the site of a former monument, since it seems to occupy quite a prominent position across the valley from Pentridge Hill? The church is dedicated to an obscure saint called Rumbold, not seeming to have any direct connection with Pentridge unless his feast day, June 24th, is an indirect reference to the midsummer solstice (June 20th-22nd) and the solar cult, which so dominated this whole region of prehistoric Dorset. The Cursus was constructed in two sections, the southern section earliest, but I can see three distinct axis. I think the mid-axis or section could equate with another solar alignment. The northerly section does not accord with solar alignments and I think might be aligned on something stellar in the northern night sky 5000 years ago. Neolithic stellar alignments are known, as at the Thornborough Henges in Yorkshire. I have found it almost impossible to plot alignments without actually observing them in the context of living landscapes, so my thoughts on alignments here remain just that until I can actually document them. I had also noticed a tributary of the Allen River noticeably crossed the Cursus further south, at Gussage, and wondered if this might have had ritual meaning for the prehistoric culture. The name of the Allen River below the town of Gussage ‘All Saints’ is of disputed antiquity, but authors Rivet and Smith suggest it may be the same Proto-Celtic name which gives us the modern Ellen river name at Maryport in Cumbria, very similar in fact to the name Allen, and that the original name would have been either Alaunos (male) or Alauna (female) for a river deity. There is equally another Allen River 6 miles / 10 km to the east whose name’s antiquity is not disputed. This is the local river by the recently discovered prehistoric long barrows at Damerham, some of the earliest such monuments discovered to date in Britain, and flows into the tireless Avon, a river as integral to Stonehenge as the iconic sarsen stone trilithons themselves. Allen as a river name may also derive from Middle Welsh ‘elain’ meaning a doe or fawn, in the sense of swift flowing or quick moving, a theory advanced for the Elan Valley place name in Mid Wales. The presence of deer is ubiquitous in Neolithic Britain evidenced by countless thousands of antlers - used as picks to construct religious monuments - practically always carefully laid upon the floor of ditches and pits, perhaps symbolically so. The Dorset village of Holwell is still associated with a myth of Henry III and a white hart or stag of such magnificent bearing that the huntsman king was unable to bring himself to slay it, as well as the local tax he imposed in the hart’s name, when he discovered that someone else had killed it. This myth containing elements of rulership and territory may be far older than Henry III’s 13th century England. This being the same century which saw Salisbury Cathedral dedicated to the Virgin Mary and its foundation site on ‘Mary’s Mead’ determined by the spot on which a deer expired which was killed by the chance flight of an arrow, shot from a bow in the hands of a bishop. The Dorset Allen is the local river at the Knowlton Henge complex and, given its identical namesake northeast of Cranborne, I am unconvinced that ‘Allen’ was not always the name of this presumably once sacred river, and in the context of Neolithic Knowlton. Many earth henges and stone circles have riverine associations, Avebury (the River Kennet) and Stonehenge (the River Avon) to name but two. There are potentially three upper watercourses associated with the Cursus, all of them ‘winterbornes’ or watercourses only apparent during the winter months, just like the Upper Kennet at Avebury. The Avebury henge also has ceremonial avenues, but marked out by megaliths, and there is also an intersection with a winterborne at a place called Beckhampton. This convinces me there is ritual liminal significance in these water crossings, in the same way that folklore reveals many fords were surrounded by legend. The Gussage seems to be the major brook of the three watercourses associated with the Dorset Cursus, certainly by the map, and below the Cursus it loses its winter elusiveness as it enters the larger Allen flowing towards the Knowlton circles. Recently megaliths, possibly circle standing stones, have been recovered from the largest henge site at Knowlton. One of these stones has some remarkable art work ‘pecked’ or carved into it, constituting a multi-ringed concentric circle. Personally I would read this as solar symbolism and I am convinced that the majority of British stone circles and earth henges are solar in inspiration, votive circles designed to be seen from above, by the eye of the sun to admire itself in its mirror likeness on the surface of the earth. Similar concentric patterns, a rare motif on prehistoric pottery, have been found close to the Dorset Cursus at several henge features on Wyke Down, and I see the association of circular henge with concentric ringed motif significant, as at nearby Knowlton. The river name Gussage is of uncertain meaning but is definitely the name of the brook which links the Gussage hamlets. The watercourse rises at ‘Gussage St Andrew’ north of the Cursus, site of a vanished priory of which only the chapel now remains, converted into a church, and containing an enigmatic ‘weeping dais’ supporting a font which seems to be positioned over a spring or well, suggesting to me some pre-Christian significance. Springs and marshy ground are known to have had special significance for pre-Christian Britons in the Iron Age, being seen as supernatural threshold locations. Many former pagan sites were adopted and Christianised as a conscious move to convert populations. As I followed the progress of the upper river southwards, dry in summer months but easily discerned from its hollow river bed, I crossed the Cursus and came to the small village of Gussage St Michael. There is very little to be seen of the Cursus today at ground level, but originally it would have been almost as wide as the length of a football pitch with two stout, ditched banks of brilliant white chalk flanking it on both sides for 6.25 miles, as it ran from Thickthorn Down northeast to the Bokerley Ditch, a ditch which today marks the boundary between Dorset and Wiltshire. At Gussage St Michael prominent springs break surface in a boggy region just south of the village, and the small river gurgles into life. Above: The St. Michael's Church Font, Gussage St. Michael surrounded by mysterious letters and symbols. The church is less than 2000 metres from the Dorset Cursus, a ritual monument from the New Stone Age. There is additionally a major spring site at the village which may have held significance for people living around this location thousands of years ago, for which there is ample evidence. Gussage St Michael is an attractive church dating from the early Middle Ages. Unusually in this church the baptismal font dating from the 1200’s is in the base of the tower, not the nave or main body of the church, from which it has been moved. That was not the only unusual thing about this holy water receptacle. The lining of the font is lead but it passes beyond the lip of the font to enclose it on the exterior as well. This malleable metal skirting was covered with antique signs, symbols and lettering. The lettering falls into several basic categories: a) peoples’ initials, b) monograms of the Virgin Mary, c) circular motifs – possibly also Marian; d) ritual ciphers – possibly inspired by the magical texts from medieval ‘grimoires’ and similar to the later works of people like John Dee, the 16th century court magus. Dee’s coded signature included double circles and a numeral. This ‘007’ sign - composed of Elizabeth Tudor’s eyes, indicating Dee’s political vigilance, and his own mystical number ‘7’ - as well as inspiring the author Ian Fleming, may have had something more than numerological value because the 7 shape also evokes a V [Virgo] as will be seen from church Marian monograms, and Elizabeth I, the ‘Virgin Queen’, was often compared to the Virgin Mary in her regal aspect as ‘Regina Coeli’, the Queen of Heaven, despite the anti-Marian Reformation. Another set of Elizabeth’s eye’s – there were numerous pairs - belonged to her favourite courtier, the Earl of Leicester who, according to the author John Deacon, signed himself with double dotted circles, the dotted circle being at once the alchemical symbol for gold as well as the astrological symbol for the sun. Above: Daisy Wheel roundel on east face of St. Michael's Church Font, Gussage St. Michael. This symbol appears in close proximity to Marian monograms. Scribed in lead on the font. Marian marks at the Gussage church were found even inside the font, and there was a fine, if imperfect, ‘daisy wheel’ on the west of the font exterior measuring several centimetres across. This motif, together with lettering and other circles also appear in Salisbury Cathedral, circles carved mostly into pillars, including dotted concentric circles and especially the petalled design, which seems to be a ‘sun wheel’ in origin, associated with good luck and the warding off of evil. The juxtaposition of encircled ‘M’ [Mary], ‘W’[V/M Virgin Mary monogram] and ‘R’ [Regina], letters on the Gussage font with the daisy wheel circle, point to an antique association of Virgin and circle, and if indeed these circles and solar daisy wheels were identified with the Virgin Mary, this would explain their appearance in churches and cathedrals. In respect of ritual lettering, there are on the font the archaically formed letter ‘I’ and ‘E’ together, marked off by a rectangle and in a remarkable feathered hand. I have seen parallel examples of the paired ‘I’ and ‘E’ in churches which seems to stand for “Iesu Elohim” – ‘Jesus, God’, perhaps an invocational formula, the letter J being a rather late introduction into the English alphabet. Above: Graphic monogram of the Virgin Mary inside the St. Michael's Church Font, Gussage St. Michael. There are two dates scribed into the font lead, ‘1696’ and ‘1700’ though these dates do not preclude earlier font graffiti and there are many other marks on the surface of the lead which are difficult to decipher. A tradition of strange letters and symbols existed at the twilight threshold between magic and religion in Europe since at least the early medieval period, with the appearance of the aforementioned grimoires, which often claimed biblical inspiration. Above: Photo-montage of the St. Michael's Church Font, Gussage St. Michael. Showing archaic ‘I’ [Iesu] - centre; encircled ‘M’ [Mary] and reversed ‘S’ [Sancta] - left; and Daisy Wheel - right. There are many more marks on the font and most are difficult to make out. font designs such as the Norman font of Saint Nonna at Altarnun in Cornwall, where these designs are a probable throw back to pagan sun wheel symbolism. Saint Non or Nonna [the name means ‘nun’] was perhaps a christianised local deity originally from Pembrokeshire, Wales and associated with a healing well there, famed for eye cures. The etymology for the word daisy is in fact ‘day’s eye’, in other words the sun, and many ‘eye wells’ were probably once presided over by deities with solar attributes. A 12th century Latin text records significant details in the life of St Nonna, in the context of possible sun goddess and material pagan background. This ‘Life of Saint David’ records that at the moment of Nona’s parturition she found herself in the vicinity of large boulders and that despite stormy weather this landscape suddenly lit up as if the full sun were shining down upon it. The large stones from the story evoke the pagan standing stones and remains which are adjacent to Nonna’s well and can be seen to this day, possibly the scattered remains of a prehistoric ritual landscape. It may seem strange to us to associate a woman with a sun symbol instead of exclusively with that of the moon, but the “woman clothed with the sun” from the Bible was identified by more than one Pope with the Virgin Mary. It might be, incredible though it would appear, that an almost unbroken tradition of solar worship, from pagan sun goddess to Christian saint, extended from the New Stone Age up until the 17th century in Britain, when these strange symbols ceased to be made, and a great tide of humanity headed towards the factories and urban centres, with the irresistible dawning of the Industrial Revolution. Local to the Gussage hamlets was Shaftsbury Abbey, founded in 888 CE and consecrated to the ‘Mother of God’ and St Edward. It was dissolved circa 1539 and demolished in the puritanical zeal of the day. Among the miracles associated with the abbey were cures for blindness, which may be significant in the context of solar wells, springs and eye cures. Shaftesbury’s main water source were “sacred springs” [‘Folklore of Wells’, 1918] at a location called Enmore Green (click here to read about 'The Shaftesbury Byzant Ceremony'). 12th century Gussage priory, though some 10 miles / 16km to the southeast, was actually a part of Shaftesbury Abbey and so shares the Marian association. A stone priory replaced an earlier, pre-Norman wooden structure at Gussage. Shaftesbury Abbey was a female religious house run by an abbess, similar to the smaller priory at Gussage St Andrew’s, for which there is now no surviving name or documented record. There are at least 90 churches dedicated to Saint Mary in Dorset. Mary, one of whose most important feast days was formerly Candlemas (February 2nd) or the biblical ‘Feast of the Presentation’ of the infant Christ, which in Britain coincided with the ancient pagan celebration of Imbolc or ‘first milk’, an early spring festival. A time marked in both traditions with fire, including spectacular candle-lit processions in Christian places of worship, candle wax having particular significance during this era. The researcher Timothy Easton has identified 17th century ritual candle writing on ceilings, testifying to the longevity of the tradition of fire magic in Europe and the association through ‘virginal wax’ with Mary. Fire and light, symbolising Jesus in the Christian tradition and the eternal light of the sun goddess for pagans, whether she be called Brigid in Ireland, Sulis in Britain, Saule in the Baltic (Sulis’ sisterly and cognate solar deity), or Minerva by the pre-Christian Romans, recalling that most eminent of ancient Greek virginal goddesses Pallas Athena whose attributes included the spinning weaving wheel, the light reflecting mirror or shield, the ocular visage of the owl and the gorgon’s head on her breastplate, whose eyes none may look upon with impunity, like the forbiddingly fierce brilliance of the sun at midday. ‘A Landscape Revealed’ by Martin Green Tempus, 2000. The Place-Names of Roman Britain’ by A.L.F.Rivet and Colin Smith , Batsford, 1979. ‘John Dee, Scientist, Astrologer & Agent’ by Richard Deacon, Frederick Muller, 1968. 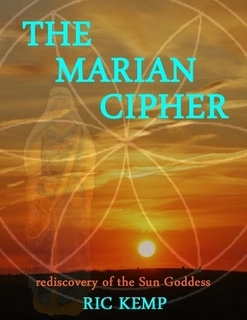 Ric Kemp's new book The Marian Cipher: Rediscovery of the Sun Goddess examines the evidence for the survival of a sun goddess archetype from earliest times down to the present day in pagan traditions, folklore, folk-Christianity and orthodox hagiography. Ric explores her ubiquitous presence in the ancient Middle East, Anatolia and Europe, and links her medieval cult to the mysterious daisy wheel circle – the Marian Cipher - which began appearing in churches from around the time of the Reformation onwards. Ric’s book takes us back through time beyond the Middle Ages into prehistory when small bands of hunter-gatherers traversed a primordial world, following herds of migratory reindeer across a post-glacial landscape, looking out nightly into the depths of space to trace their Mesolithic mythology in the ceaselessly revolving northern stars, charting the immemorial story of the loss of the sun goddess and her mythic return.